Judge allows Shkreli lawyer Greebel facing fraud charges to take Cancun vacation. 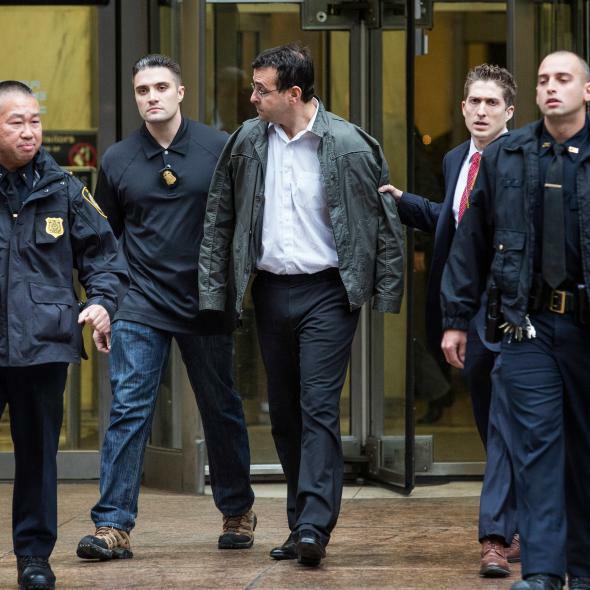 Attorney Evan Greebel (C), is accompanied by law enforcement officials after being arrested as a co-defendent with Turing Pharmaceutical CEO Martin Shkreli for securities fraud on Dec. 17, 2015 in New York City. Pharma bro Martin Shkreli’s alleged accomplice in a securities fraud scheme defrauding investors is 42-year-old attorney Evan Greebel. Both Shkreli and Greebel were hit with criminal charges to the tune of a seven-count federal indictment last week. Both men pleaded not guilty and were released on bond (Shkreli $5 million and Greebel $1 million) and ordered to turn over their passports and remain in the New York City area. A tough week for the pair. This week, however, Greebel was faced with another problem. He had already planned a nice little family vaycay to Cancun, Mexico with the kids, the in-laws, you know the deal and the—totally unexpected—federal charges against him threatened to ruin the long-planned vacation. So Greebel petitioned the court to allow him to go to Cancun and Brooklyn U.S. District Judge Kiyo Matsumoto said, in effect, sure—as long as he turned his passport in after he gets back. The Greebel legal team is pretty clearly not concerned with optics or public opinion.